Powers/Abilities: Terra-X possesses the metamutant ability to psionically manipulate molecules of rock and earth, allowing her to transform her very body into "rocks and dust" and "join with the earth" as well as use the earth itself as a weapon against her enemies. Terra-X was also skilled in the use of her long-handled axe. Her metamutant abilities were supposedly amplified after she was implanted with one of the Brood aliens. (Assassins #1) - Terra-X was mentioned as the alleged metamutant daughter of assassin Dare (Slade Murdock). (JLX #?) - During the "AGE OF DOOMSDAY" crossover, new revelations concerning Terra-X came to light. (The Exciting X-Patrol #1 (bts)) - Following the "AGE OF DOOMSDAY", "bad girl" Terra-X joined Niles Cable's team of doomed metamutants known as the X-Patrol. Unbeknownst to the team, however, Terra-X was a traitor. On one mission (presumably a mission that X-Patrol member Shatterstarfire (Princess Koriand'r of Tamojoran) was not involved with), Terra-X revealed her true allegiances and delivered her X-Patrol teammates into the hands of their enemy, X-Stroke the Eliminator. The X-Patrol was nearly wiped out by X-Stroke, but they narrowly escaped in the end. (The Exciting X-Patrol #1 (bts)) - Some time later, on the island-nation of Zenosha, Shatterstarfire saw Terra-X captured by the alien Brood and subsequently "changed into rocks and dust" (although this may have merely been Terra-X using her metamutant power). Deeply troubled by what she saw, Shatterstarfire returned to Zenosha with Niles Cable on a two-person crusade to rescue Terra-X from her Brood captors. (The Exciting X-Patrol #1) - "The Curse of Brother Brood!" - In the fetid underground caverns beneath Zenosha, Niles Cable was overpowered by the Broodlings while joining Shatterstarfire on her crusade to rescue Terra-X from the Brood. Shatterstarfire retreated to Manhattan in order to enlist the aid of her X-Patrol teammates and rescue Niles. When Shatterstarfire and the rest of X-Patrol later returned to the caverns beneath Zenosha, they witnessed Brother Brood presiding over the ceremony in which Terra-X was implanted with a Broodling. Emerging from the Brood Pit, Terra-X was instructed by Brother Brood to attack the infidels who desecrated her holy rebirth. 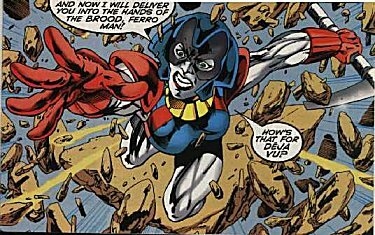 Terra-X readily complied and attacked the X-Patrol, vowing to deliver them into the hands of Brother Brood just as she had delivered them into the hands of X-Stroke the Eliminator earlier. Terra-X used her metamutant power to hold the X-Patrol at bay with a shower of rocks. 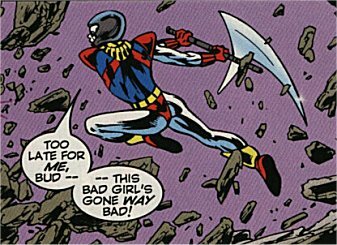 Eyeing Jericho (Niles Dayspring), the newest member of the X-Patrol who had joined the team after Terra-X's original betrayal, Terra-X questioned if he was supposed to be her "replacement" and was about to attack Jericho with the blade of her axe. 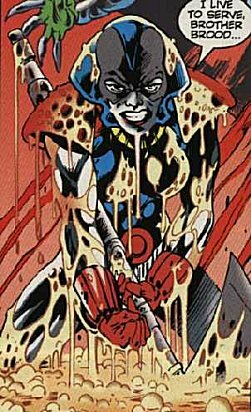 But before Terra-X could make contact with Jericho, X-Patrol member Elasti-Girl (Janet Van Dyne) shrunk down to a miniature size and entered Terra-X's ear canal, causing painful inner ear damage that put the traitorous metamutant out of action. In the "Last Writes" letter column in ASSASSINS #1, editor Kevin Berganza revealed that Dare the Terminator's alleged metamutant daughter, Terra-X was "still running around" and that new revelations concerning her would crop up either in the ASSASSINS series itself or in the "AGE OF DOOMSDAY" crossover taking place in the JLX series. Terra-X later went on to join and betray the X-Patrol. Her fate after the events of THE EXCITING X-PATROL #1 remains unknown. Kevin Berganza is an amalgam of Kevin Dooley and Eddie Berganza. "AGE OF DOOMSDAY" is an amalgam of Marvel's "AGE OF APOCALYPSE" crossover and DC's Doomsday. Special thanks to writer Barbara Kesel for clarifying some of the component sources for her amalgamated characters and providing some additional insight into the Amalgam Universe! All characters mentioned or pictured are &trade; and © 1941-2099 Marvel Characters, Inc or DC Comics. All Rights Reserved. If you like this stuff, you should check out the real thing!